4-bottle wine coolers or wine refrigerators provide proper wine storage conditions for 4 standard size bottles of wine. Their compact size makes them ideal for occasional wine drinkers who don’t have much space in their home for storing countless bottles of wine. In addition, a 4-bottle wine cooler doesn’t cost a lot of money yet it is a nice-looking modern appliance that looks good in any kitchen or home bar. Compact size – Wine coolers with max. 4 bottles storage capacity have small, compact size allowing countertop or tabletop placement. Portable wine coolers – The small size and light weight (cc. 10 lbs.) make these mini wine coolers portable units so if you go on a holiday, or rent a cabin somewhere you can easily pack it and enjoy a perfectly chilled bottle of your favorite wines anytime during your vacation. By the way there are nice portable wine cooler bags designed for picnic goers too. These picnic wine cooler totes can store and keep cool 1-4 bottles of wine and come in various decors and colors. Silent, vibration-free operation – most mini wine coolers use thermoelectric cooling also known as Peltier technology that doesn’t need compressor to generate cool air thus thermoelectric wine refrigerators are quieter than compressor-operated fridges. Vibration in the long run isn’t do good for wine, that’s why thermoelectric wine coolers are so popular appliances for storing wine. 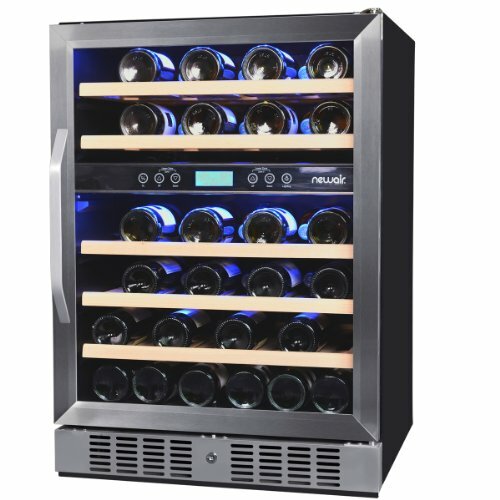 Single temperature zone – due to the small storage capacity all 4 bottle wine fridges have one temperature zone which is enough for a mini wine cooler. If you want to have a 2-zone wine refrigerator then you need to digg deeper in your pocket. Take a look at some good-value dual temperature zone wine coolers. Low cost – the 4-bottle wine coolers listed on this page are inexpensive models that cost around US$ 60-190 . Always compare prices online to get the best price on a model. You can also look for discount wine coolers to save more. Energy-efficient operation – if installed properly according to the appliance’s manual, thermoelectric wine bottle coolers consume less electricity than compressor-run wine refrigerators. Easy installation – the electric 4-bottle wine coolers plug into standard power outlet (110 V in case of models manufactured for the US market). Check whether you have power outlet near the spot you plan to place the cooler. Note that these wine bottle coolers are only for freestanding use and to ensure proper air circulation you need to leave enough space (cc. 2-4 inches, but always check it in the appliance’s manual) around the sides, at the top and the back of the unit. See more advice on where to place your wine cooler. 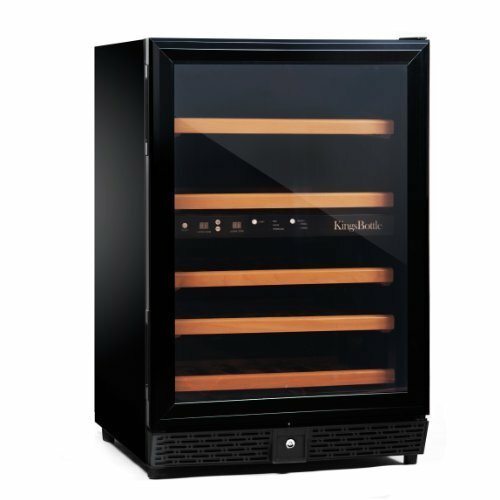 Very little maintenance – apart from an occasional cleaning (wiping the interior, the racks and the outside of the cabinet with a wet cloth – always unplug the unit before cleaning -and let it dry) these small capacity wine fridges don’t require special maintenance. The external fan needs cleaning every 3-4 months (depending on how dusty is the environment where the unit is placed). The best is to use compressed air to get rid off dust accumulated on the fans. Always read the appliance’s manual before cleaning your wine cooler. Here are the most popular 4-bottle wine cooler models. See a Side-by-Side Comparison on the Top Three 4-bottle wine fridges. Includes main technical features and prices (cost/bottle is a good indicator for comparing various wine coolers) for a more easier overview to help you choose the best-value unit. Black Cabinet with black-trimmed transparent double pane glass door. control panel is integrated in the top door frame: it has the temperature control buttons, the display screen, and the interior light switch. Digital thermostat – easy-to-use touch pad controls for setting the temperature. 45-65 deg. Fahrenheit temperature range – allowing you to chill whites to around 45-47 °F or simply store reds at around 55 °F. blue LED temperature display – clearly displays the set temperature. low-intensity interior light (the light switch is on the control panel). Price of the Haier HVTS04ABB 4 Bottle wine cellar: cc. US$ 60-90 (US$ 15-22.5 per bottle). Haier Wine Cooler Refrigerators – overview of Haier wine storage appliances and information about the company. red, digital temperature display in Celsius (°C) or in Fahrenheit (°F). Convection circulation system ensures even temperature distribution within the cabinet so that every bottle of wine will be cooled to the same temperature. This model is available in other color finish (model No. : WC-400-187): black and chrome cabinet with blue LED display. Price: cc. US$ 120-160 (US$ 30-40 per bottle). See other Chambrer wine coolers including 2-zone units. The 4- bottle Koolatron wine cooler has a slim, longish shape and it can be placed either freestanding or mounted horizontally or vertically under a kitchen cupboard (see photo). Digital temperature display and touch button controls for setting the temperature: there’s white wine setting for 48 °F (9 °C) and red wine setting for 59 °F (15 °C). Price of the Koolatron 4-bottle wine fridge: cc. US$ 90 -190. (US$ 22.5 – 47.5 per bottle). Warranty: 1 year. Out of the 4-bottle wine fridges listed in this article I like the Soleus unit the least. The design and decor of the cabinet is less sophisticated than that of the other make’s and model’s. the temp. range of the Soleus 4-bottle wine cooler is 39 – 82 °F and it cools to 25 degrees lower than the ambient temp. 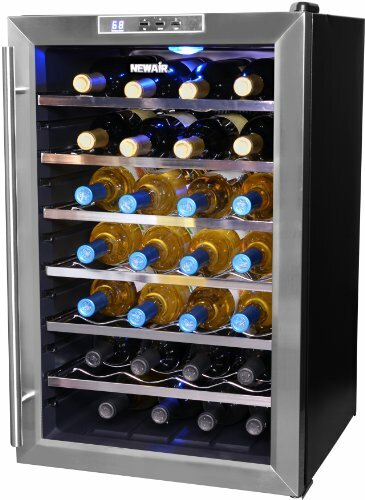 The Soleus JC-4 wine cooler is more a mini fridge than a wine cooler since you can store and chill soda and snacks. The appliance can also be used for warming up a drink or food (86°F – 126°F ) Note that between switching from COLD to HOT mode you need to turn the unit off for at least 5 minutes. Great for putting in your car or caravan. 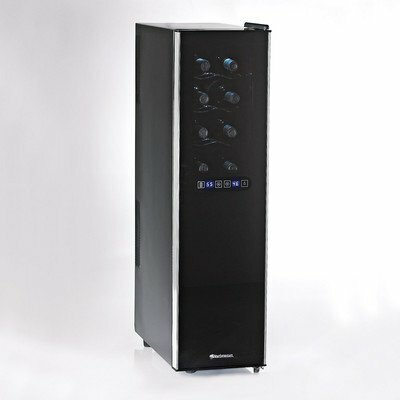 Price of the Soleus 4-bottle wine cooler: cc. US$ 80-90 (US$ 20-22.5 per bottle) with 1 year limited warranty. 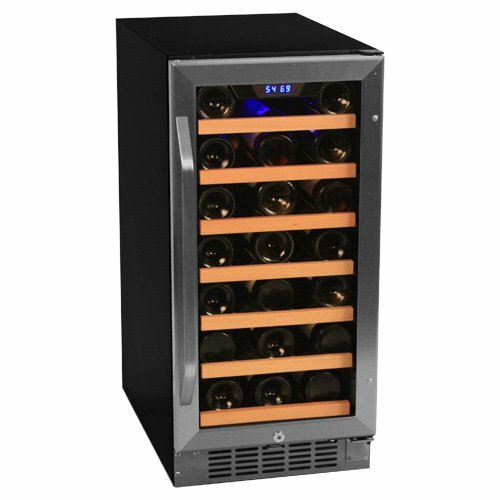 12-Bottle Wine Cooler Comparison – compare 12-bottle wine fridges by various manufacturers.